Pullman Car Company Kitchen First "Fingall"
This coach, a standard `K' type Pullman, was built by the Birmingham Railway Carriage and Wagon Co. for the Yorkshire Pullman. However it was put to use on the "White Pullman" which, in 1929, was named the Golden Arrow. After the war it saw further use on the Southern Region, including the Bournemouth Belle. Right: Example of the marquetry panelling in Fingall. Each Pullman car had unique patterns of Marquetry. Fingall's is amongst the finest of any surviving. On withdrawal it was sold to Lord Montagu, forming, with the Locomotive "Stowe" and two other Pullmans, a static exhibit at his motor museum at Beaulieu. When no longer required here in 1972, it was sold to the Isle of Wight Steam Railway, where it was used for a number of years as a static catering facility. 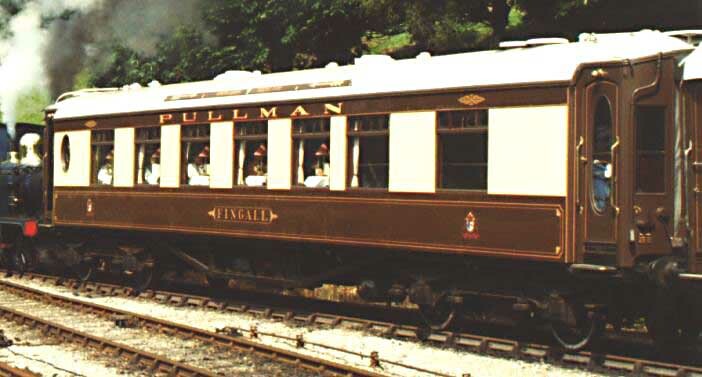 For many years the Bluebell had been looking for a suitable "Flagship" Pullman vehicle, and so Fingall became the first of our four Pullmans to arrive. Its restoration was started by the volunteers of the Horsted Keynes Pullman Car Group in 1985. 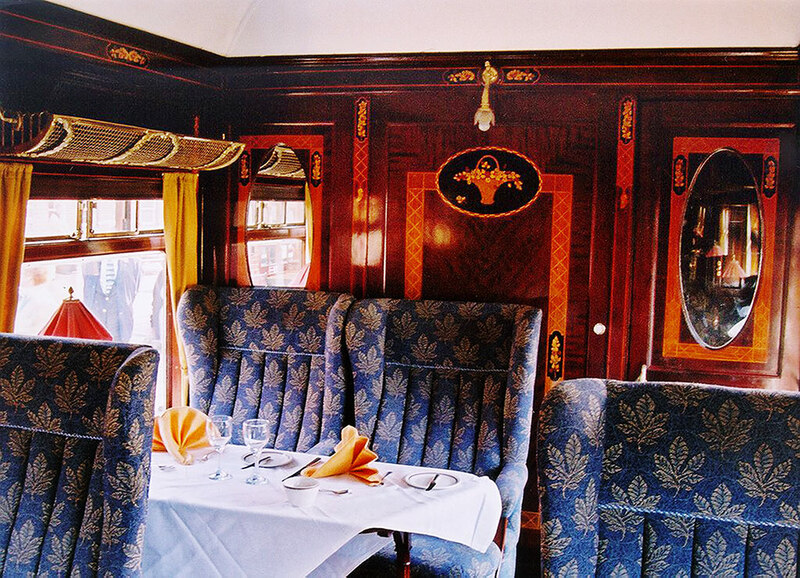 Much money was raised by the group to progress the work, partly through the volunteer-operated Bluebell Cutler dining train. Three years later the Railway itself took over responsibility for the project. The comprehensive nature of the work, involving complete renewal of the vestibules at each end as well as two sections of bodyside and the complete re-construction of the interior. With the completion of the kitchen to the very latest hygiene standards (which absorbed much of the estimated £200,000 cost of the project) we finally saw a coach emerge in 1992 which was equipped for service and sound of body for (hopefully) decades to come. 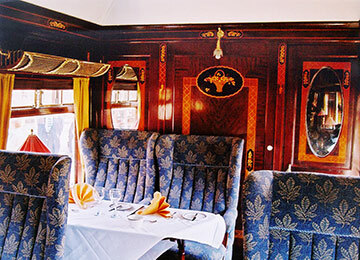 Fingall is often to be seen running in our Golden Arrow Dining Train, and all the food served on the train is prepared in its kitchen. A 360-degree view of the interior of this coach is available. © Copyright April 1995 by Richard Salmon.